We're a little sad in Candy's Land this week. After a courageous fight with cancer, our friend Scout was ready to go home to heaven. Scout was very much part of our Candy's Land crew -- often at Second Sunday Brunch panting on the picnic blankets alongside us, or coming over to the house with her dad, Mom and Shuga's friend David (or Uncle Higgy as he's been known here), whenever an evening of fun was to be had. We're going to miss having Scout in our lives. But Mom says she knows her Guapo just got another friend to wait for all of us on the other side of the Rainbow Bridge. She was a total all around badass who bridged the animal kingdon and our human world with poise and no regrets. Scout could say as much to you with one look from her waterfall blue eyes as she could when she'd sing along to match your pitch or throw her howl out to the wolves circling in the distance out in the Gros Ventre Range; it was all communication that made sense. She was a punk rocker with a heart that knew no bounds. The type of girl who would wear combat boots with a short sundress to the highest society function of the year and win the affection of every guy and friendship (albeit with a tinge of jealous envy) of every woman there. Scout could enjoy the bouquet of a fine pinot noir, discuss the vintage, and then excuse herself to have a nip from her boot flask with the band and fit in perfectly with either camp. She brought together elegance and courage; as if Grace Kelly and Chrissy Hynde ever hung out. While some dogs would run head first into the Charleston surf and get knocked back before stubbornly trying again, Scout would find herself a place along the tide and let the surf make its way to her. She scaled 14,000 ft peaks in Jackson, surveyed the view, and then chose her route down the side sending powder up around her muzzle and over her head; always with the purpose to have fun. 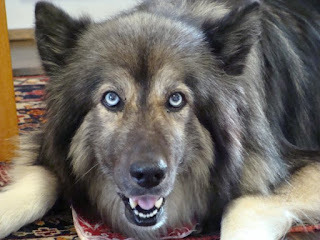 Whether she was accidently scaring little kids who thought she was a wolf, or purposely scaring the conservative red state extremists who view dogs as simple creatures with her free spirit, Scout was noticed any and everywhere she went. She was without a doubt my right hand girl. To Scout and Uncle Higgy, Candy Lou will always love you.